Please make sure that the water pressure is in the normal range 3-10bar (44-145PSI) to make the hose extend to 100 ft.
 100 ft Garden Hose 4-PIECE GARDEN HOSE SET - Each 100 ft expandable hose set (expands from 33' to 100') includes a nylon storage pouch,plastic holder and 9-pattern spray nozzle for versatile effectiveness.  HIGH QUALITY HOSE- Kink-free,new leakproof technology,strongest expandable hose triple layer latex core and solid brass fitting shut off valve for long term lawn and garden use. 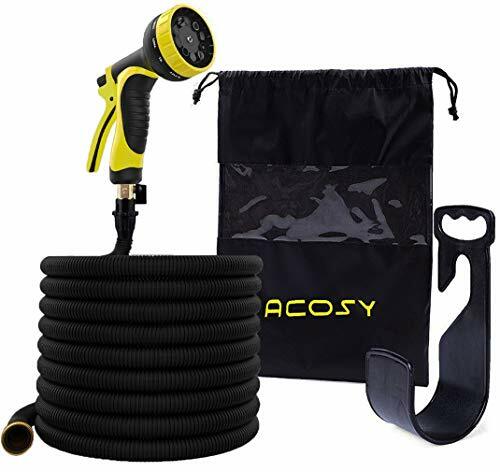  MULTI-FUNCTION NOZZL - 9-way nozzle spray system to meet all your watering needs; For garden watering, car washing, and showering petsfor plants, flowers, trees & cars.  LIGHTWEIGHT AND COMPACT : Storage bag perfectly accommodates 100ft hose, sprayer and plastic holders that can be neatly placed anywhere in your home, garage, shed or on the terrace.  MONEY BACK GUARANTEE - 30-Day Risk-Free Guarantee and a 12 Month Manufacturers Warranty.If you have any questions about the product, please feel free to contact us. If you have any questions about this product by Acosy, contact us by completing and submitting the form below. If you are looking for a specif part number, please include it with your message.